Missionary Chapel and Seminary offers honorary Christian degrees. Receive your Master of Divinity, Doctor of Divinity or Doctor of Theology diploma NOW, with ease and at an unbelievably low price! Just choose your field of interest and click the appropriate link below. Imagine the prestige this impressive diploma will provide you, hanging in your home or office. Receive the degree that speaks to your status as a religious leader. Why wait? To qualify for this degree, please use the begin now button bellow to get started. The program is free. You only pay $25.95 to receive your diploma and become a registered graduate with Missionary Chapel and Seminary. To qualify for this degree, please use the begin now button bellow to get started. The program is free. 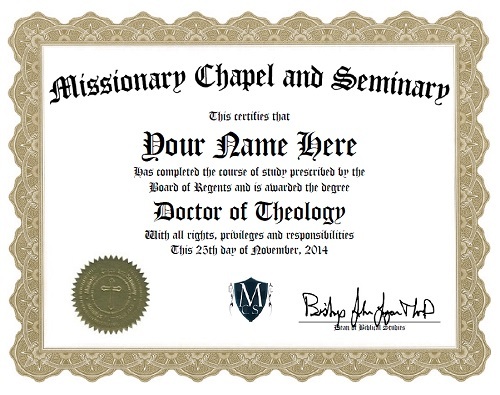 You only pay $27.95 to receive your diploma and become a registered graduate with Missionary Chapel and Seminary. To qualify for this degree, please use the begin now button bellow to get started. The program is free. You only pay $29.95 to receive your diploma and become a registered graduate with Missionary Chapel and Seminary.